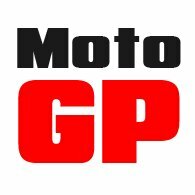 We figure that many people will know that the brand represents the crème de la crème of motorcycle apparel. We think it’s a great idea, but for those of you who want to get the most out of their precious weekends, we thought we’d tell you what a great day you can have on the bike if you choose to visit this part of Surrey. It’s the most expensive gear out there. It uses all the best materials and technologies, and it’s put together with longevity in mind. 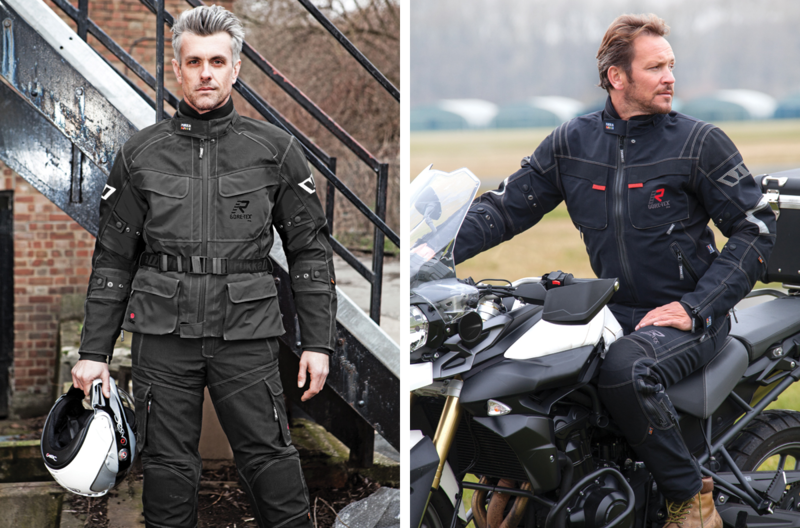 You only have to pick up a Rukka jacket to know that it’s a quality bit of kit. So what we’re going to do here is to try and explain the differences between the various models in the range, or rather those models that are imported into the UK. We think this should be useful, because every jacket has its own distinctive features and, to tell the truth, it’s all a bit confusing. Even for us! So here goes. Technically, the top of the range jacket and trouser combination is the Armas. What makes it more expensive than the next model down, the Armaxis, is the Superfabric material on the shoulders, elbows and knees. This is an amazingly abrasion resistant fabric. 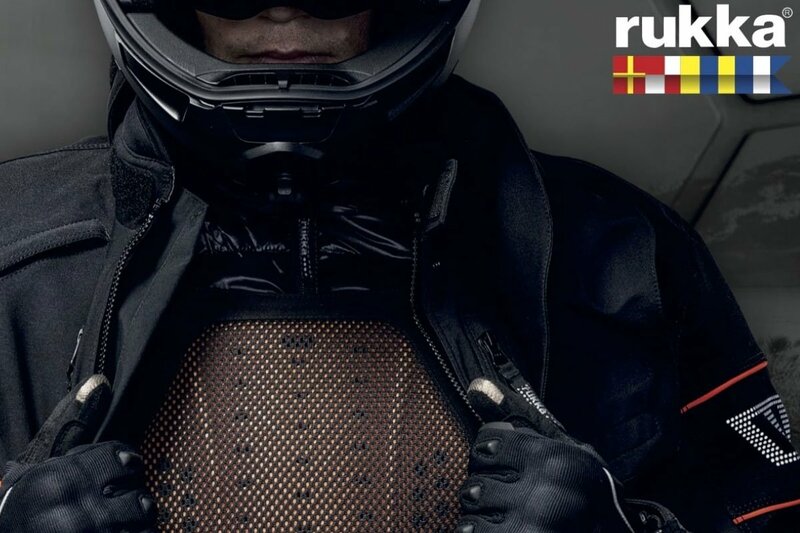 But it’s so costly that later in the year Rukka will be making the Armas jacket without it. The Armas also has the world’s most waterproof zip, known as a ‘Gore Lockout Closure’. It works, but it does make the jacket a little stiff; not everybody likes it. This model also has a removable thermal liner with Outlast. The Armaxis is a similar jacket, based on the some cut. It has a YKK Aqua Seal zip and no Superfabric. But it does have a neat Wind Stopper inner jacket that can be removed and worn on its own. One very small rung down from the Armaxis is the Armaxion. It’s a slightly longer jacket that has quite prominent reflective piping. It has a thermal liner without Outlast, and a less fancy, but still effective, waterproof zip. Like the Armas, the Armaxis and Armaxion, the Cosmic is constructed from Gore-Tex’s Pro 3 layer laminate, so it offers very similar levels of protection from the elements to its three more expensive counterparts. The Cosmic, therefore, is really just a styling exercise. It’s still very much a road jacket, but with its belt and two patch pockets, it has a bit of an adventure riding feel to it. It’s not, though, a jacket you’d go serious off-roading in. We figure that many people will know that the brand represents the crème de la crème of motorcycle apparel. But Rukka does do a proper adventure jacket, and it’s called the Paijanne. Basically, the Paijanne has very little by the way of thermal properties, and this is normal for such a jacket, when you might well be crossing deserts and passing through jungles. If it’s cold, you layer up. But what you do get is a removable waterproof liner, again important in such a jacket. And that’s because a waterproof lining hampers air flow, and in extreme hot conditions, you want maximum air. The final jacket that is imported into the UK is a new one called the Flexius, and it is, we have to admit, probably the company’s most wearable and easy to live with product. It’s not made from the Gore-Tex Pro 3-layer laminate system. Now this is a fabulous construction that works splendidly, but it does make for a rather stiff and slightly less comfortable garment, because all the layers are basically glued together. Instead of Gore-Tex’s 3 layer system, the Flexius jacket has a Gore-tex drop liner. In theory, this is a little less waterproof, but in 95% of situations you won’t notice the difference. You’d have to be riding for many hours in a real downpour before you experienced any real water ingress. What makes the Flexius even more comfortable to wear is the fact that the jacket is made from Cordura’s four way stretch material. Of course, even though the Flexius sits at the lower end of the Rukka Spectrum, it still has its full panoply of bells and whistles: a removable thermal liner with Outlast, a Gore-tex collar, ventilation openings, and volume adjusters. We just think that if you’re looking for a Rukka jacket that you can wear all year round, and be comfortable in whatever the weather, the Flexius is all the jacket you’ll ever need. The fact is that Rukka doesn’t do average. Any Rukka jacket or pant is going to give you the very highest level of protection, be it from the road or the weather. Which is why every Rukka garment comes with a full five years guarantee. And don’t get me started on Rukka gloves. They’re brilliant. They’re amazing. They’re quite simply the best.